An infant's skin is sensitive and tender hence requires the best protection and nourishment. Nature's Veda Dasapushpam Baby Oil is 100% natural and contains the extracts of 10 sacred flowers in an oil base. This skin immunity oil is a powerful Ayurvedic oil which acts as a skin & scalp tonic and protector. The 10 sacred flowers are infused in the purest oil i.e. virgin coconut oil. Most of the herbs used have strong proven anti-microbial properties that can prevent an array of skin diseases. 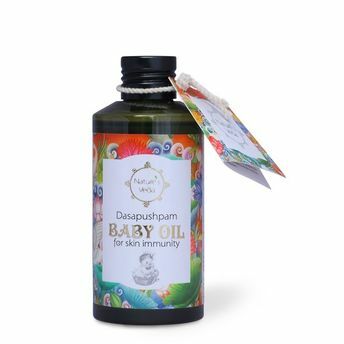 Dasapushpam baby oil, once applied optimizes the peripheral circulation, stimulates both the sensory and motor nerve endings, removes dead skin and other minute pathogens infesting the skin, expedites the growth and maturity of the skin layer and as a result regularizes hair growth as well. Optimum care is taken in identifying the right packaging for this Oil. The bottle is made from unbreakable material so that it is safe to use around the baby. The flip cap makes sure the oil does not spill or leak while you travel. Also, the oil is thin in consistency so that it is easy to wash off and has better absorption to the skin. Additional Information: Nature's Veda caters to the modern customer with 100% natural Ayurvedic Lifestyle and Personal Care products that are easy to use and extremely effective in results. Explore the entire range of Creams, Lotions & Oils available on Nykaa. Shop more Nature's Veda products here.You can browse through the complete world of Nature's Veda Creams, Lotions & Oils .